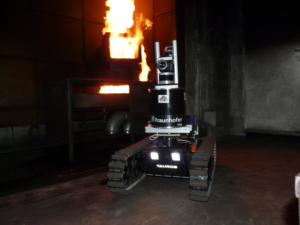 SmokeBot in the training facilities of the Dortmund firebrigade. Apparently, I like to play with [robots close to] fire. I am interested applications of machine learning techniques both in context of robotics and intelligent control. Currently my research revolves around robot with monitoring or exploration tasks in harsh environments, e.g. for occupational health monitoring in steel foundries, for the detection of gas leaks or for scouting disaster sites in the presence of heavy smoke. Previously, I have been working a lot with learning systems to control combustion processes in coal-fired power plants. Our Husky operating in a foundry. One a more theoretical side, I am interested in feature selection techniques, information-theoretic learning, reinforcement learning, sensor planning for mobile robots, spatio-temporal interpolation methods for environmental mapping and people tracking. 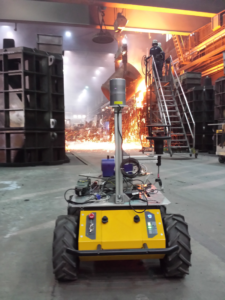 I am working as scientific manager in the SmokeBot H2020 project, enabling robots to operate in low visibility scenarios and have been the project leader of RAISE, developing a robot- assisted occupational health monitoring system for foundries.